I like to refer to February 6th as “Yankee Christmas.” Because on this date in 1895 in the not-so-little town of Baltimore, the New York Yankees all-time greatest player and the savior of Major League Baseball was born. Ruth’s life story has been told in scores of biographies and several times on the big screen. He was such a bad kid, his bar-owning father gave up custody of his only son to a Catholic reform school for boys when Ruth was just seven years old. That horrible parental decision turned out to be the biggest break in Ruth’s life when a Brother at the school taught young George Herman how to play baseball. By 1911, he was playing minor league ball for the Baltimore Orioles and in 1914, his contract was sold to the Boston Red Sox where he quickly became one of the American League’s star lefthanded pitchers. But disaster was brewing for the national past time. The 1919 Black Sox scandal threatened to destroy the public’s interest in the game. 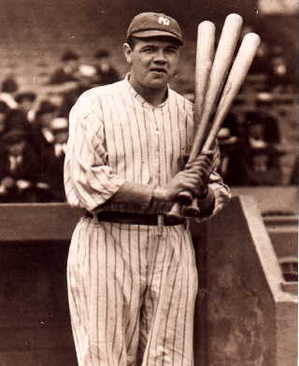 The sale of Ruth to the New York Yankees, his conversion to an everyday player and the profound ongoing success the Bambino had with his bat not only brought back the sport’s disgruntled fans, it helped bring millions of new fans to the game as well. First, Ruth and the Yankees replaced the Giants as the most popular baseball team in New York City. Then, as the roaring twenties unfolded, Ruth’s prodigious slugging and his team’s consistent winning turned the Yankees into the most popular and successful sports franchise in the country if not the world. The thing that always convinced me that Ruth truly was the greatest all around hitter in the history of the game was how much better he performed than his peers. In 1920, his first season with New York, Ruth hit 54 home runs. There was only one other entire team in baseball that hit more round trippers that year than Ruth hit himself. The National League’s Philadelphia Phillies managed to hit 64 home runs as a team. Let’s do a little bit of statistical comparison to put what Babe Ruth did over nine decades ago in today’s terms. In 2011, the Texas Rangers finished second in Major League Baseball in home runs, with 210. (By the way, the Yankees led all of baseball in home runs last year with 222.) To match what Ruth did in 1920, which was hit 84% as many home runs as the team that finished second in the entire league in that category, the 2011 Major League home run champion would have had to hit 176 home runs. Jose Bautista led the league in 2011 with 43. Though he was close to perfect on a baseball field, he had lots of behavioral problems off of it. His appetites for booze, food, gambling and women were as prodigious as the power of his swing. He was completely self-centered and often and unbelievably played years with teammates without even bothering to learn their names. He lacked manners, morals and memory. But boy could he hit a baseball. This former Yankee pinch hitter and this former New York pitcher were both also born on the Bambino’s birthday. It is really ironic IMO that Camden Yards is built where Jidge’s father’s bar was. RIP Babe.